A bridge inspired by the curvature of a common sea dragon. The second architecture studio developed drawing and model-making skills with emphasis on digital representation and fabrication. 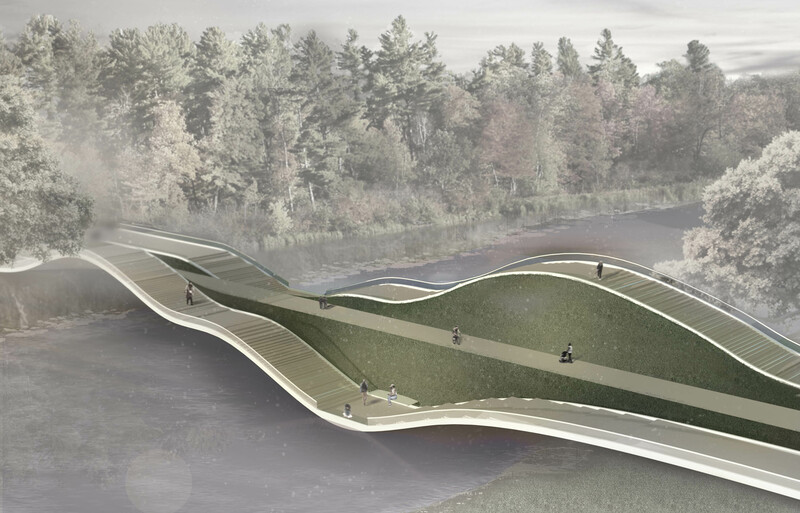 A biomorphic analysis served as the foundation for the project – a space for observation. In my case, I decided to analyze a common sea dragon and use its curvaceous forms as the basis for a space. I created a series of grids which captured a number of qualities that ultimately inspired a bridge. The bridge’s expanding and contracting nature inspires flow in three different lanes, two of which rise and fall to enable a unique viewing experience on a river – to get as close to the water, or to watch from the most elevated point. A center lane enables normal flow and accessibility for handicapped users. Bench seating encourages gazing during sunrise and sunset, designed specifically to encourage experiencing watching the sun as it interacts with the water. This project is entirely conceptual – it is not designed to be a real structure. The first project was constructing an analogue based on the analysis of the animal.